Ah, Rapture City. Anyone who has played Bioshock will immediately remember a number of dark encounters simply by mention of the name. Of course, if you have watched the video above already (or have read any Digital Diamond entry over the last year or so), you know where this is going - the guys over at HungerCraft have recreated Rapture City, in as much detail as possible, in Minecraft! The video above shows a mashup of footage from the game itself, interposed with the same scenes, recreated in the recreated map in Minecraft, to show off the city in all its glory. If you are eager to get your hands on this particular gem, unfortunately it is not currently available. However, the Hungercraft guys assure us that it is in the works to make ample use of this map in a way that is accessible to anyone, so keep an ear to the ground for updates! Ooh... Very nice. Can't wait until it'll be put up for download. I'll certainly have fun with this. (And first. Sorry.... I just had to). Yea, I definitely don't want this... I NEED this!!! Aaaand calendar marked for the 19th. The minecraft community needs this! Pretty sweet, cant wait to play! Now we need Batman: Arkham City. Seriously. Wow this is really awesome. I hope more video game cities get rebuilt like this. You guys should try hungercraft! Looks interesting. I was never a big Bioshock fan myself, but I know more than enough about it to know that this HungerCraft map is going to be the bomb. Thankfully I have Steam, if that happened to me I'd cry. Such a good game. I hate teasers like this. "Oh, hey.... You know this awesome thing we have? Well here is a video of it, here is why it's awesome, we know you want it, but you can't have it yet. SORRY!!!" That really annoys me. If it's something you have to pay for, it's different because that is a sound marketing strategy. For something free it's more just like saying "So you are hungry? Well how about I give you a nice juicy steak dinner with a side of mashed potatoes and peas?.... Oh, you thought I meant now? Nah, I meant sometime in the future." I take it this is more of a loosely-themed Minecraft equivalent map than a strict-recreation of Bioshock. The first thing I remember starting Bioshock were the giant hall/rooms/staircases (that also appear in the rest of the game) with lights automatically coming on by themselves, and then of coarse the open bathysphere. However, the intro to this does not seem to be like that. The staircases are small, some lights are already on when you walk in, and then the character walks into complete darkness. There's some light flashing on and off, and out of nowhere now the player is falling down water source blocks gapped with air pockets. The actual rooms inside rapture don't remind me of the actual game, either. Maybe it's the classic glowstone or redstone lamp on a fence post for lighting. maybe it's the classic trees, or just the materials they used. In any case, it seems like a themed map more than a side-by-side recreation. Always good to see hungercraft on the MCF, it's gonna be an epic game guys! Map looks awesome can't wait to try it. 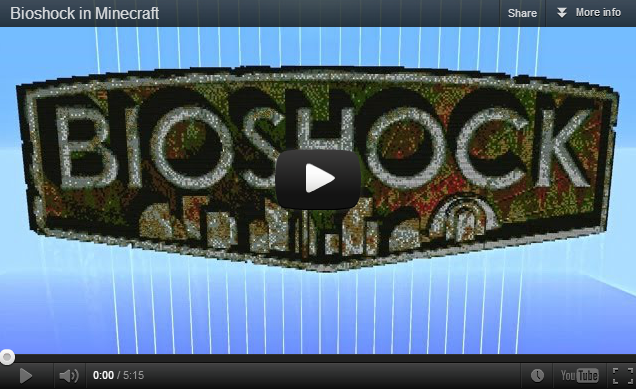 A custom texture pack for Bioshock might be a good idea, hopefully someone is kind enough to make one.